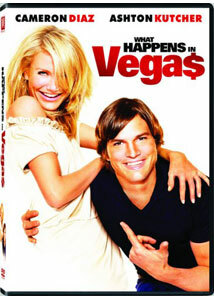 Ok, I�ll admit it, the only reason I was even remotely interested in the Ashton Kutcher/Cameron Diaz vehicle What Happens in Vegas is my upcoming trip to Sin City. The film features a match up, the pairing of stars Cameron Diaz and Ashton Kutcher, that some consider to be a dream, and others think is a match made in hell. Jack Fuller (Ashton Kutcher) has just been fired from his job by his boss, who just so happens to be his father, Jack Fuller, Sr. (Treat Williams). Joy McNally (Cameron Diaz) is an overly organized Wall Street trader who has just been dumped by her boyfriend Mason (Jason Sudeikis) at the surprise birthday party she was throwing for him. These two don�t know each other, but meet unexpectedly during a get-away in Las Vegas, where they stay out all night, and wake up in the same bed the next morning, married. They instantly decide to get an annulment, but when Jack wins a slot machine jackpot with Joy�s quarter, a judge (Dennis Miller) orders that the money is frozen until they try their �marriage� for six months. So, they move in with each other, trying to prove to their marriage counselor (Queen Latifah) that their marriage is working and that they�re not actually trying to kill each other. The one thing this film accomplishes is that it solidifies the notion that Diaz and Kutcher are a pair of the worst performers (tough to call them actors) in Hollywood. They�ve done just fine in the past playing the leads in awful films on their own, but in this first pairing of the two together, we get awful times 100. Neither of them has anything resembling charm or, more importantly, comedic timing, but, then again, Dana Fox�s screenplay is one of the least funny pieces of writing to be put to film in years. Unfortunately, at least for this Vegas lover, the film only stays there for about the first 20 minutes or so. Once our two protagonists are accidentally married, they�re back in New York City, and we�re left with a series of boring, unfunny scenarios that always end predictably. Speaking of predictability, if anyone reading this doesn�t know how the movie is going to end, then you�ve been fortunate enough to have avoided the thousands of similar films that have been released in the last 20 years with the exact same ending. Just when it looked there wouldn�t be a single laugh in this fiasco of a film, along comes the great Zach Galifianakis. The simple fact that he can overcome such a horribly unfunny script and still deliver laughs whenever he�s on screen is a near miracle, and a testament of his talent. Zach is at his best during his amazing stand-up performances, but he�s starting to really make an impression whenever he shows up in a film, even one like this. So, while the rest of this unfunny mess makes it extremely difficult, I have to recommend What Happens in Vegas. Just be sure to fast-forward to Zach�s scenes. Image Transfer Review: The 2.35:1 anamorphic widescreen presentation is a good one, but not without its flaws. The images are sharp and feature great detail, while well-rendered colors do a nice job representing the bright lights of Las Vegas. There is some dirt and grain that is distracting, which is rather inexcusable for such a recent film. Audio Transfer Review: The Dolby Digital 5.1 audio track is decent but nothing special. The surrounds are active during the Vegas scenes, providing an accurate representation of the sounds of a Vegas casino. The dialogue is crisp and clear, blending in nicely with the rest of the overall mix. From the Law Firm of Stephen J. Hater, Esq. Extras Review: A rather large collection of extras includes an audio commentary track by director Tom Vaughn and editor Matt Friedman. This pair is very excited about their film, and gives us some nice, candid stories about the 46-day shoot. There�s also Sitting Down with Cameron and Ashton, an eight-minute piece that is essentially an interview session with the two stars of the film sitting in a posh Vegas suite. The two are basically talking amongst themselves, discussing their past experiences in the city and their experiences making the movie. Easily the best and funniest extra feature, DVD Extra Time with Zach Galifianakis runs for eight minutes and finds one of the funniest comedians talking with director Tom Vaughn. What begins as a typical interview quickly turns into a showcase of Zach�s amazing sense of humor, and gives viewers a taste of what he has to offer in his unforgettable stand-up performances. From the Law Firm of Stephen J. Hater, Esq. is a nearly-three-minute �commercial� for Rob Corddry�s character from the movie. This is very funny stuff with more great work from Zach Galifianakis. We then get a five-minute gag reel that�s much funnier than the film itself (thanks again, Zach G.), six deleted and extended scenes, and a collection of trailers for other Fox Home Entertainment releases. It�s hard to tell people to rent a movie and only watch about 10 minutes of it, but Zach Galifianakis� work in What Happens in Vegas should be seen, despite the rest of this turkey. Fox�s Extended Jackpot Edition of the film also makes this release worth checking out thanks to Galifianakis� appearance on a few of the extras.